Verde LLC offers a wide variety of Renewable Energy product line; ranging from wind turbines, fuel cells and solar panels up to renewable hydrogen generation system with state of the art technology that is first on the market. With our advanced technology, our system is the first system worldwide that is capable to fully adapt intermittent renewable power into hydrogen production process. 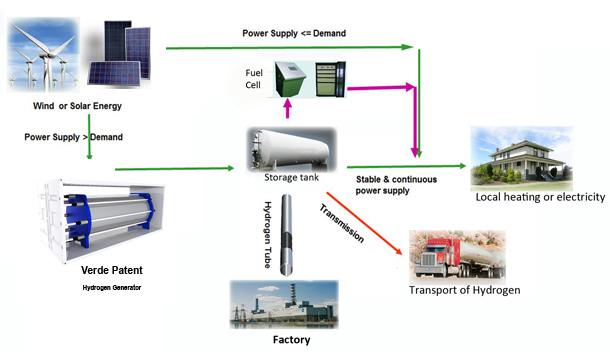 Our system can efficiently transfer wind/solar power, which originally can’t be used or delivered, into hydrogen, and then (1) either use hydrogen directly for industrial production; (2) or use Hydrogen Fuel Cells/Internal Combustion Engines to produce electricity/heat with hydrogen. With a completely innovative internal design, the hydrogen generating system can adjust the hydrogen production by a SMART Controller to directly utilize 100% intermittent electricity. This system is suited perfectly for integration with the fluctuating voltages of intermittent power generating equipment, like wind turbines/solar panels. The key uniqueness and advantage of the Verde product is that its operation and production of hydrogen can be adjusted widely to operate with the fluctuating power of wind turbines or other power sources; the first and only one of its kind in the world, pioneered by Verde LLC. In this system, a small Hydrogen Generation Unit can adapt a very high electric voltage, and thereby reduces capital cost by over 30%. What’s more, since no transformers are needed, the Hydrogen productivity can be improved by 10-20%.